In 1885, German explorer Heinrich Ludwig Wolf (1850-1889) was the first European to enter the Kuba kingdom in the present-day Democratic Republic of the Congo. United under one ruler in the 17th century, Kuba refers to both an empire and each of its 18 distinct African tribes. An engraving illustrating Wolf’s first encounter is reproduced in the catalog for “Kuba Textiles: Geometry in Form, Space, and Time,” a groundbreaking and visually stunning exhibition at the Neuberger Museum of Art. One might expect, then, that a Kuba exhibition would be resplendent—a stupefying array of exotic feathered headdresses and ornately beaded costumes. Nineteenth- and early 20th-century photographs, postcards and trading cards here show Kuba kings swaddled in multicolored armadillo-like regalia—riddled with glass beads, ivory and mottled seashells; as fireworks of plumage shoot from their crowns, and all but their tightly cropped faces disappear beneath bedazzling second skins. Curated by Marie-Thérèse Brincard, the Neuberger’s show of more than 100 objects does include a gathering of superb shell-and-beadwork pieces—intricate, ornamental royal baskets, sashes, bracelets, anklets, armlets and a visored crown that exemplify the Kuba’s decorative embrace of horror vacui. Here too is a section devoted to tukula—a reddish powder, or subsequent paste, extracted from trees and utilized for everything from money to sculpture. Dry, tukula was used to dye textiles. Mixed with oil, it served as a cosmetic, which stained the interiors of its wooden storage boxes the colors of blood and fire. Tukula hardwood, when shaved and mixed with clay and leaves, produced a malleable paste that was sculpted into talismanic animals, tools and human heads. These blackened, handheld abstract objects, known as mboong itool, suggest carved burned-wood and reddish sandstone. Made only by women, and incised with abstract patterns, they were often bestowed as funerary gifts. A remarkable ensemble of tukula, mboong itool and lidded wooden boxes—all never before exhibited—is on display. Though abstract, the mboong itool represent turtles, huts, headrests, boats, masks, insects, musical instruments and the moon. One ubiquitous form, the shinambwa, or the wagging “tail of dog,” is also believed to represent a knife or a catfish. Resembling those forms, and also a butterfly, bird, foot, hook, boomerang and amoeba, it is commonly found on the Kuba’s masterly, unassuming woven raffia fiber (palm leaf) textiles—whose richness, subtlety and understated power are the soul of this exhibition. Abstract, spare and often monochromatic, the raffia fiber textiles—experienced here in numerous men’s and women’s ceremonial skirts and overskirts, some nearly 30 feet long—were also at the very heart of the Kuba. In the show’s catalog, Ms. Brincard reminds us that African sculpture, favored by Western collectors, was long-believed to be “Africa’s major art form,” but that “textiles, pottery, decorative arts, and furniture [are] of equal cultural importance in African societies.” “Kuba Textiles” redresses that misconception. And it does so much more. Not only is this show overflowing with huge, gorgeous textiles, but it acts as an object lesson in the language of pure abstraction. The textiles’ decorations may at times suggest abbreviated or distilled forms from the natural world, but forms exist here as elemental forces. The Kuba skirts achieve what the Dutch abstractionist Piet Mondrian referred to as “dynamic equilibrium”—the energetic bond between figure and ground, energy and form, stasis and movement, the organic and the rational. These extremely long rectangular skirts, completely unfurled here—hanging from the ceiling and mounted in enormous vitrines—expand like abstract landscapes. Earth-toned, their grounds are usually a natural tan or deep tukula red. They are starkly, geometrically decorated with black, blue, red, brown, tan and white checkerboards, rectangles, lines, diamonds, circles, dashes, dots, triangles, organic shapes and interlacing, zigzagging and overlapping patterns. When overlying sandy colored scraps of cloth are sewn together with darker thread, they conjure an undulating desert. At other times, as in “Central panel for a woman’s royal overskirt (ncák buiin)” (19th century? ), interlacing, variously sized crosses—as if lifted directly from the carpet pages of the medieval “Lindisfarne Gospels”—suggest the strumming pulse of nature. Since these ceremonial skirts were originally wrapped around their wearers, they were never intended to be experienced as full compositions. 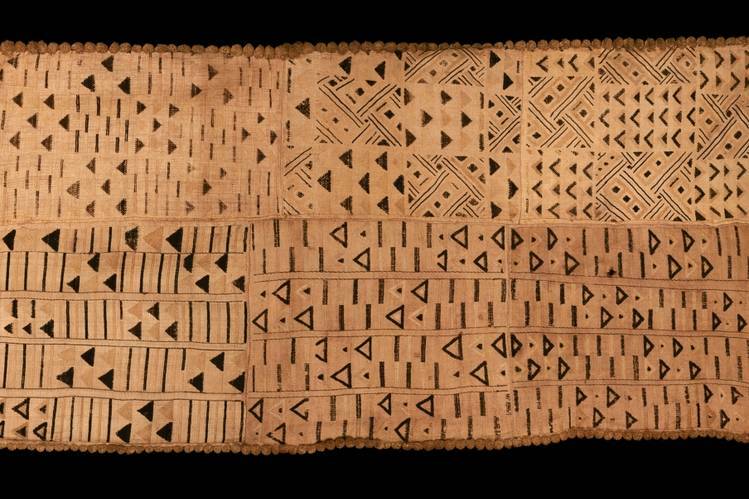 But, since they were created as a whole (woven into cloth by Kuba men; then hemmed, dyed and embellished by Kuba women), one senses in each skirt an evolving composition in which forms, patterns and logic develop, as if working out their own fates. Most striking here is a sense of birth and evolution; of forms and forces interacting, responding, gathering and multiplying. The roughly 3-feet-by-9-feet “Panel (?) for a ceremonial skirt” (late 19th-20th century), made up of polyphonic series of multisized diagonals, lines, rectangles and triangles, is as rhythmically dynamic as the taut, pulsing plane, comprising variously sized, primary colored rectangles, in Mondrian’s “Broadway Boogie Woogie.” Other pieces, though sparer, are equally ordered and comprehensive. Or they are activated further with scalloped borders, fringe and pompoms. In “Four panels for a ceremonial skirt” (20th century), within a series of consecutive rectangular mazes, we experience points becoming lines, which widen into planes and then group together, suggesting veins, limbs, deltas and archipelagoes. Explored here are notions of penetration, expansion, growth and progression. 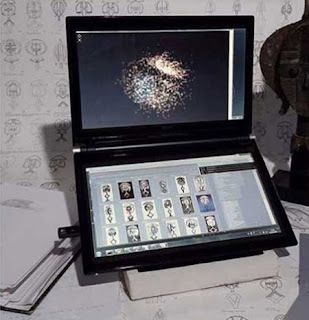 We experience the birth of the diagonal, the diamond, repetition and frieze. Looking at this and other masterworks here, I couldn’t help but wonder if Wolf, who was first to write about and to sing the praises of Kuba textiles, felt as if he had encountered the cradle of civilization. 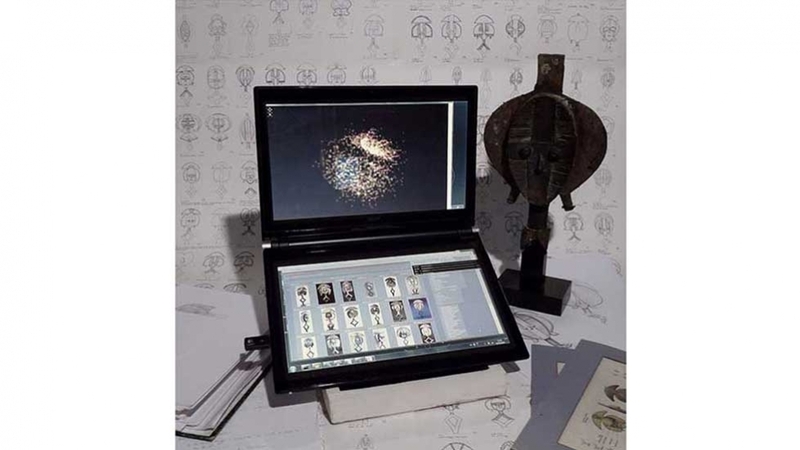 This October, the Pulitzer Arts Foundation will present Kota: Digital Excavations in African Art, an exhibition that examines new ways to study and reveal the hidden histories of antique Kota reliquaries from Gabon. The exhibition, co-curated by Frederic Cloth (a Belgian computer engineer and independent researcher) and Kristina Van Dyke, will present more than 50 reliquary guardian here.